A broken and desolate Earth. A young girl struggling to survive. A lost boy with a powerful secret. A discovery that will change everything. In the distant wake of a plague that has decimated the Earth's population, humanity is split in two: The rich and powerful live in skycities that float overhead, while those who remain on the ground have gathered in settlements strewn across a dying planet. 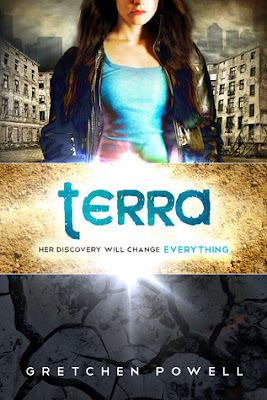 Eighteen-year-old Terra Rhodon is a terrestrial--a denizen of the barren groundworld--who makes her living as a scav. Long abandoned by her father, her caregivers gone, Terra supports herself and her younger brother, Mica, by scouring the earth for discarded scraps and metals to recycle for profit. One day, while on a routine scavenging run, she discovers something that shocks her home settlement of Genesis X-16. When the value of her discovery is revealed, Terra's world is turned upside down. Terra suddenly finds herself asking questions no one will answer. Her search for the truth leads her to Adam--a beguiling skydweller unlike any she has ever met. But Adam has secrets and a quest of his own, and with him by her side, the world Terra thought she knew begins to unravel. Soon her discoveries unearth a terrifying conspiracy that has the potential to shatter everything--a revelation that will test the bonds of loyalty, family, and love. The first book in debut author Gretchen Powell's anticipated Terrestrials series, Terra catapults you through a story filled with blood-pumping action, intrigue, and surprising twists that will both wrench and warm your heart. As the hidden truths of this world unfold, new dangers that loom on the horizon are sure to leave you waiting breathlessly for the sequel. From these words on we dive into the dystopian world of Terra and her little brother, Mica. Terra is Mica's sole caregiver, which means she is responsible for making the money in the family. She works as a scavenger collecting objects to sell at the recycling center. She and Mica have always just scraped by until one object changed their lives forever. After being chased by raiders Terra is saved by Adam in a bio dome outside the walls of Genesis X-16. The story that follows is an awesome tale of adventure, discovery, danger and love. I found myself rushing through the parts where Terra was in danger trying to see what happened next. Also trying to form an understanding of what all of this craziness had to do with Adam and WHO was Adam exactly.? Powell did an awesome job of world building. I felt as though I was in those walls watching Terra and Mica go about their daily lives. I identified with Terra. Being the older sister in the family, with a younger brother, I always had to be the more responsible one. Terra was a great heroine, with amazing strength, who loved her brother and did anything to protect him. This awesome strength saw her through everything she went through, to the very end of the book. I can't wait until the next book to see what adventure Terra, Mica, and Adam have next. Terra is definitely a book you don't want to miss. I give Terra 5 stars! It was a fresh new read on dystopian novels. Gretchen Powell grew up in far-off places. She is 24 years old, half-Chinese, and the owner of two adorable miniature schnauzers. They wear many sweaters. By day, she types and types (and types and types) for personal, professional, and cathartic purposes. She is a lover of books both young and adult, but her favorite genre combines those terms. By night, she binges on episodes of Doctor Who and sleeps fitfully. Sometime in the mid-afternoon, she writes another blog, called "Honey, I Shrunk the Gretchen!" about food, fitness, and her life.